I came to IMU in 2011 and the founding Dean, Prof Toh Chooi Gait, who is currently the Pro Vice-Chancellor was the one who gave me the opportunity to explore myself here in IMU. I still remember those days when me and Prof Toh would sit down together for hours to develop the curriculum in Endodontics for undergraduate students. When you asked me about being the Head of Oral Health Centre, I think I am a work driven person. I like to take up challenges and deliver up to the expectations. I think that is probably the reason why I got the charge of Oral Health Centre. No. When I joined dentistry, I wanted to be a clinician and work in my own clinic. I never thought that I would be in academia. 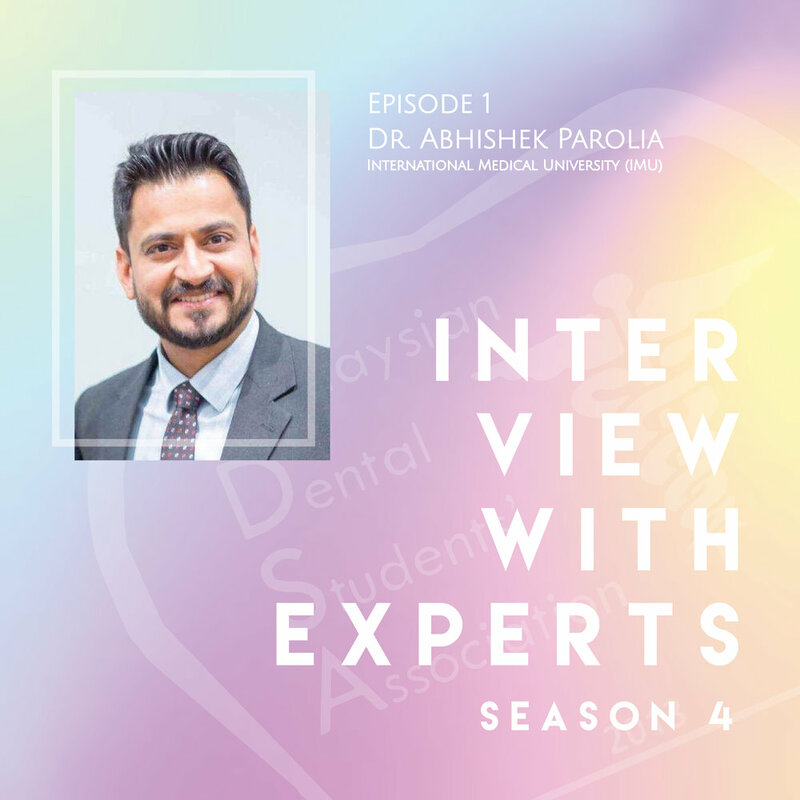 However, after finishing my specialization in Conservative Dentistry and Endodontics in Manipal University in India, I joined as an Assistant Professor in the Department of Conservative Dentistry and Endodontics in Manipal University. When I first joined the department, the department gave me a very different academic environment, where there was this freedom for me to develop my clinical skills, to enhance my research interest and my publication activities. That changed my mindset completely. Then I thought to myself, dentistry is not only about the clinic, it is also about evolution and what we are going through. In fact, research has become such an integral part of dentistry. Now could you imagine, we talk about painless dentistry, which 20-25 years back, was almost impossible. And that has been possible because of the evolution in research and what we have come across. So I feel dentistry has been quite interesting for me. Endodontics is the branch where we deal with the heart of your tooth. The heart of the tooth is pulp tissue, which has got nerves and blood vessels, which keeps your tooth alive and healthy. So when it gets infected, it could be in the form of decay or any trauma. Eventually, the patient starts developing pain because of the infection. So we endodontist try to remove the infection and save the tooth for the patient. Hence, this is a branch which gives you immediate rewards, because when a patient comes to you with pain, and you relief their pain, they feel very happy and you feel very satisfied. Now when it comes to Endodontics, I think this is one of the few branches or specializations in dentistry where there is always something new happening, which keeps me updated and excited about the new materials, new instruments, new technology. So I feel very passionate about endodontics and I don’t think I could have done anything else except Endodontics. Before I talk about clinical audit, I would like to tell you about someone who introduced me to Clinical Audit, and he is the Dean of IMU School of Dentistry, Professor Allan Pau. He was the one who introduced me to Clinical Audit in 2012 and that’s how I learnt how to train people in clinical auditing. Since then, I’ve been training my undergraduates and people across the country on how to do clinical auditing. Clinical audit is actually a very good tool to identify the gaps, not only in the record keeping work that we do for the patient, but also in the care that we provide for the patient. We identify the gaps, we cater the material measures, we close those gaps, and we improve our oral health care, which is what we provide to the patients. You’ll be surprised to know that these students who have been doing the training, have gathered a lot of data and presented the data in the national and international conferences. They even won awards, in both the national and international level. In fact, I was also privileged to get an award in a very prestigious IADR ( International Association of Dental Research) conference in 2017, in USA, where I got the best faculty presentation award. All thanks to Prof Allan and all the students who have been working with me since then. Yes, as I’ve mentioned to you earlier, I came to Malaysia in 2011, and before that I was in Manipal University in India. I’ve travelled a lot across the globe and I feel travelling makes you a better person. I recommend everyone to travel, because it actually helps you to interact with people of different values, different regions, different backgrounds, different mindsets and different skills. That helps you to broaden your horizon and you’ll start developing yourself. This is because when you see people from all over the globe, working together to achieve a common goal, it really helps you a lot. So I feel that conducting workshops nationally and internationally has helped me a lot, personally as well as professionally. When I joined Malaysia, honestly, I did not expect so much from Malaysia. Malaysia is a beautiful country, with beautiful people around, and the best thing about Malaysians is that we are ready to learn. And when I say we, I include myself as a part of Malaysians, because I’m a part of Malaysia right now. Dentistry is very satisfying. When I joined dentistry, I always wanted to have a sense of work life balance. You can be very satisfied as a professional, at the same time, you can enjoy your personal life as well. You can really maintain the work-life balance in dentistry. Besides that, dentistry has also evolved a lot as I’ve mentioned to you earlier. It is no longer just the clinical field nowadays. You can be a clinician, you can be an academician, you can be a researcher, and you can be a consultant for the industry. So dentistry provides you a platform where you have got many avenues to look forward to. University is place where students can develop professionally and personally. I miss university days, where you could explore and expand your skills, your learning, your friendships, your dreams and your future goals. I personally feel that if you join dentistry, not conservative dentistry or endodontics or any branch, that is going to be later. As a beginner, university is a place where you develop a lot. I believe that each and every student should just enjoy the journey and they should do the best work that they can do, to achieve whatever goals or desires they have in their mind.